Can democracy be achieved in any country, particularly in Haiti over a period of seven months? in Haiti Over a Period of Seven Months? CAMBRIDGE, MASSACHUSETTS - Over the past 29 months, Jean-Bertrand Aristide and his fanatics have maintained that "there can be no democracy in Haiti" without him. Proceeding with their claim, "upon resuming his presidential duties in the tiny Caribbean nation, there will be democracy for everybody." What an aberration? Certainly, Jean-Bertrand Aristide, the exiled president, now living in Washington, D.C., the imperialist capital as he used to call it, was said to have been elected with 67.5% of the votes cast in the December 16, 1990 presidential election. Still about 33%, mostly middle and upper class citizens, voted against him. They couldn't accept the one-dimensional candidate whose motto was "anti-Macoutism." Aristide's ability to speak the language of the masses had a powerful allure. Many Haitians electors, however, voted for him under duress, for fear of being associated with members of Francois "Papa Doc" Duvalier's militia, commonly called Tontons-Macoute. In this regard, I am taking the liberty to say that his seven months in office were just an extension of the 187 years of political farce, political demagoguery, political incompetence and the kleptocracy, which today, are still the components of the Haitian political culture, reflected in the Haitian political lexicon. Aristide is not a saint as he has been portrayed by the United States' news media and others. He is a demagogue! He is a madman! Above all, he is a power-hungry man and Maoist. Why? Because his seven months in office are well-marked as an era of pronounced "dictatorship of the proletariat" without precedent in Haitian history. Let's take a look back at some issues. To begin with, Aristide had no real economic program for Haiti. Nor did he have a political program for the Caribbean nation, except threatening to further burn citizens alive so he could extort money from them. This was evidenced by his September 27, 1991 speech at the Haitian National Palace. In that speech, he told the crowd, composed mostly of Third World standard "bidonville," or slum residents: If you catch a thief, a robber, a swindler, or an embezzler, if you catch a fake Lavalas (adherent of a system of organization whose main approach is equal distribution of wealth), ... if you catch someone who does not deserve to be where he is, do not fail to give him what he deserves (an allusion to the practice of putting used car tires around the necks of victims and pouring gasoline and setting them on fire - the crowd cheered ... Do not fail to give him what he deserves! Do not fail to give him what he deserves! Your tool is in your hands. Your instrument is in your hands. Your Constitution is in your hands. Do not fail to give him what he derives. (loud cheers from the crowd). That device is in your hands. Your trowel is in your hands ... Article 291 of the Constitution, which is symbolized by the center of the head where there is no more hair, provides that the Macoutes are excluded from the political game. Do not fail to give them what they deserve. We are watching all Macoute activities throughout the country. We are watching and praying. If you catch one, do not fail to give him what he deserves. What a nice instrument! (loud cheers from the crowd) ... What a nice device! (the crowd cheers). It is a pretty one. It is elegant, attractive, splendorous, graceful, and dazzling. It smells good. Wherever you go, you fell like smelling it. (The crowd cheers). 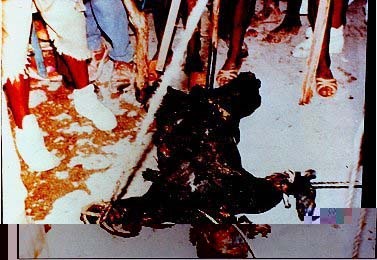 An assumed political opponent of brutal dictator Jean-Bertrand Aristide burned alive. As Aristide continued with his terrorist speech it became clear that Haiti's tiny bourgeoisie was his real target. "While there are patriotic bourgeois who earned their money through honest means, unfortunately this is the bourgeois' last chance ... It will not be my fault, because this money is not really yours. You acquired it through criminal activity. You made it by plundering, by embezzling ... You made it under oppressive regimes ..., under a corrupt system ... Today seven months after 7 February, on a day ending with the numerical seven, I give you one last chance, because you will not have two or three more chances, only one. Otherwise, it will not be good for you! (Applause) ... Haaaaaa!" (The crowd cheers). In its Article 189, the 1987 Haitian Constitution stipulates that any attempt to carry out acts of subversion, which are limited to coup d'état and destruction of state properties, constitutes a threat to "State Security." A defendant or defendants convicted of such crime shall be confined in a penitentiary for a maximum of 15 years. Ironically, Dr. Roger Lafontant, a former Tonton-Macoute supreme chief and author of that law, who attempted but failed in January 1991 to prevent the "little red priest" Aristide from ascending the presidency, was confined for life. He was later murdered allegedly on orders from leftist tyrant Aristide on September 29, 1991. Between 70 and 100 suspected political opponents were necklaced. Some remains of the victims were eaten by the populace which washed down the flesh with clarin, a cheap Haitian rum. Coincidentally, a Haitian political and social scientist who spoke to me on condition of anonymity for this article has stated: "No one needs to hold a Ph.D. in political science to say that from day one Aristide failed to realize that his policies were far from being the best for Haiti. He never understood the basic principles of democracy and how they should be implemented. Such a pattern of behavior led a great number of academics, diplomats, and ordinary Haitian citizens who voted for Aristide believing that he would be the first democrat that Haiti ever known to ask what's going on? How can most of these poor and illiterate people take seriously a president who can only make them feel good but unable to alleviate their misery? They were finally convinced that Aristide did not look or act presidential. They saw Haiti sliding inexorably into the embrace of Fidel Castro. Prompted by a growing fear, the business sector began to cut back on certain operations. Some ceased doing business altogether. This resulted in the loss of thousands of light manufacturing jobs that the poverty-stricken citizens desperately needed. Indeed, many citizens were truly afraid for their lives. This was especially so for Americans living in Haiti who were viewed by members of the regime's "Politburo" as villains and Satans. Even the police and members of the Haitian army were powerless. On August 13, 1991 the mobs departed from their headquarters at the Haitian Department of Interior and began to gather by the thousands inside and outside the parliament building, beating some Deputies to prevent a vote of no confidence against Aristide's rubber-stamped Prime Minister, Rene Preval, a former neighborhood baker with no experience in government affairs. Members of the army as well as of the Catholic Church turned a blind eye to this chaotic situation, for fear of being burned alive by mobs. They had not forgotten the burning of the old Haitian Cathedral in Port-au-Prince by the mobs searching for Archbishop Francois Wolf Ligonde who they accused of being a Macoute and a CIA agent. Also, in January 1991, the Papal Nuncio was stripped to his underwear and molested and his Zairean secretary suffered machete blows that almost cost him his life. It would have taken me days of writing to further enumerate Aristide's dictatorial acts during his short tenure as Haiti's eight president - depending on how you count them - over the first five of Duvalier's departure to France, in 1986. In short, I am certain that democracy is not an "instant" product, something that can be achieved overnight. It's, rather, a system to which one aspire on a sequential basis. For example, there was a time in the United States when women were not allowed to vote. Not long ago Blacks and Whites were forbidden from sitting at the same table, as racial segregation remained the law of the land in several states. After years of struggle, however, in 1964 the amended Civil Rights Act reversed such a mandated pattern of social behavior. It is time for Aristide to stop lying to my fellow Haitian compatriots that there will be democracy in Haiti once he returns. As the previously mentioned political scientist has said, Aristide does not understand even the rudimentary principles of democracy and how they should be implemented. He is a maniac depressive! He is a sick man! He is a threat to the Americas, as evidenced by his attempted implementation of communism in Haiti, even though such a political system has been totally discredited and no longer the order of the day. As of this writing, he has no plan for Haiti other than continuing to collect money from some of the estimated one million hard-working former or Haitian nationals living in the U.S. and elsewhere for the purpose of invading Haiti from U.S. soil, (a violation of the U.S. Neutrality Act) to unseat the Haitian military. As I was concluding this article, some economists returned my telephone calls. One noted that according to the 1992 World Development Report, published for the World Bank by Oxford University Press, gross domestic investments have plummeted to 8.0 percent from, 14.8 percent. Not only the country has public and private debts of $874 million that it is unable to service, its estimated 85% illiteracy rate will be an obstacle to economic development for decades. This situation, as depressing as it is, will sure leave the very few Haitian professionals and intellectuals with no market to produce for, even 30 years hence. I wonder how Haiti can start the 21st Century on a positive note! Where do I go from here? It is a "One Billion Dollar Question." Obviously Haiti is a basket case. Most of the economics professors I have contacted testify to this. Haiti, mountainous land, is the poorest nation of the Western Hemisphere, with a per capita income of $370. Haiti is a place where people have no hope. It is also a place where politicians traditionally seek power just for the sake of power. That is well illustrated by events of the past 190 years of Haiti's so-called independence from France. Haiti's chronic problems cannot be addressed and resolved just by one person, as Aristide pretends. Instead, Haitians, in collaboration with the international community, must forge a policy of "public consensus" in their divided and impoverished nation. It must be accomplished by what can be best described as a "non-party system" made up of democrats, nationalists, and, yes "Duvalierists." This will, hopefully, pave the way for the rebuilding of the never-healthy Haitian economy on a stable foundation, transcending what's called "the politics of identity" or "the politics of difference." Yves A. Isidor is spokesperson for "We Haitians United We Stand For Democracy, a Cambridge, MA-based nonpartisan political pressure group.